On my Mac, the site at https://www.aa.com/homePage.do properly fills in all three fields: advantage number, last name and password. But in iOS 1Password the last name doesn't get filled. The other two do though. 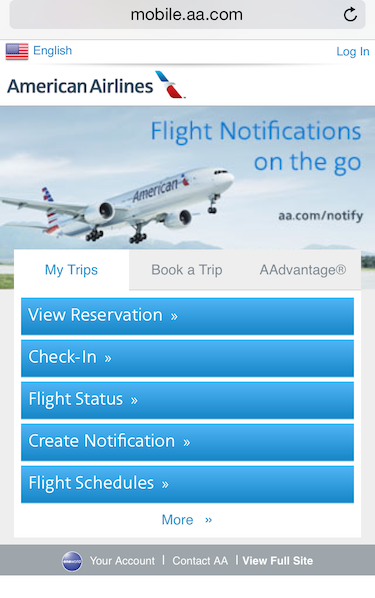 So what's happening with American Airlines webpage? When you manually save a Login item as you did, it records all the fields on that page along with anything you've entered. So far that tallies with your experience. You reload the page on your Mac and 1Password recognises the page; the fields match and all is good. Now when you say 1Password for iOS my testing would suggest you mean not just 1Password for iOS but specifically on an iPhone. I believe this to be the case because in my testing it would seem to be the mobile version of the site that causes the discrepancy. If I test on an iPad everything works just like my Mac because it's viewing the same page. As the page is quite different, even though it holds the three fields in common, we don't respond in the same way we do when we see the exact page the Login item was recorded on. At the moment I see a couple of possibilities. You can switch from the mobile site to the full site (see the View Full Site link in the bottom right hand corner). Your Login item will work based on all my testing. You could create a second Login item for the mobile version of their site. Not ideal because then you have two items needing updated - doable but far from ideal. https://www.aa.com/login/loginSubmit.do This is the actual login page your credentials get submitted to. This page doesn't have a mobile and full site version so it doesn't change depending on what device you visit it with. It fills everywhere on both OS X and iOS from a single Login item but as I don't have a real account with American Airlines I can't say what happens when you submit. This is where you could help us. Ideally we'd love to know how the login page behaves for you on both your Mac and iPhone. Does it log you in and does it then take you somewhere sensible like your account page or return you to the home page? 3 looked the most interesting so I tried it, but now it doesn't work on my Mac or my iPhone. I think I will have to start over again. I'll report back later. OK. I created a new login with suggestion (3) and it works on the iPhone and on the Mac. One question - even though it works, on both the Mac and the iPhone the Login item only shows the two fields. Why doesn't it show all three fields? The info must be there, but it's not visible in the entry. What you're seeing is the difference between the visible information and what we refer to as web form details. In a Login item we have traditionally kept two key pieces of data visible, your username and your password, and these are normally linked to the web form details. Now with the extension we work with the web form details but a lot of the information in there is meaningless and serves no purpose in being visible so it's all kept stored in it's own space. The web form details is what allows the extension to fill on a page that requires more than just a username and password but as historically there isn't support in the visible section for more than just the username and password those bits remain hidden. On a Mac, if you click on the show web form details you would see everything recorded by the extension, which will include all three fields. 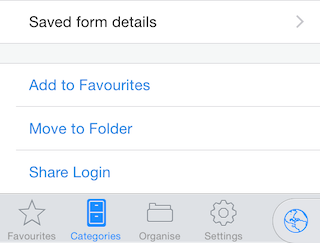 In 1Password for iOS you would tap on the Saved form details line when viewing a Login item. What I tend to do with sites like this is I use a custom section and custom fields. They don't link up with what's in the web form details but it allows you to keep a nicer Login item by storing the additional information in tidy way. It's entirely up to you, this is a visual aspect as the web form details section holds the data although you could argue that a custom field is safer long term as updating a Login item will never touch the custom fields. Does that help explain how 1Password works at all? Hi @littlebobbytables - I can confirm that clicking on show web form details does, in fact, show all three fields. That is reassuring. In the iOS app I don't see a Saved form details line when viewing the Login item though. I don't really understand what you meant by using custom fields and how that would help login. If they don't match up with the web form details how can they be used to populate the fields at the site? That's odd, you should have. When I view an item this is what the bottom of each page looks like for me, does it look different for you? Now custom fields won't ever help you actually log in, they're merely a way to store additional information. You could equally use the Note field that all items have but our custom fields allow you do some neat stuff. For example a field can have it's type changed from simple text to a password field. It won't get used for filling but you can click on the password to copy it and it remains hidden like the default password field at the top. We also used custom fields to add support for Time-based One-time Passwords (TOTP). At the moment we don't fill in the TOTP code but the use of the field allows you to easily copy the current code and paste it into the website. So for sites that demand security questions I set up a custom section to store them. I set the field title to the question and then the field value to the answer. Some people will use two fields, one for the question and the next for the title as they find it easier to read (completely a preference thing). If I'm being less than honest about my birthdate because I don't think a site needs to know that sort of information I'll use another field to make a note of what I told them should it ever become required. So none of it will help with the actual filling, it's about a tidy way of adding information to a Login item but use of the Note field would achieve the same goal. In my case above "Add to favorites" I see an icon that says "Pro Item Features". I also don't see "Move To Folder" - just Add to Favorites and Share Login. Perhaps what you see is one of the "Pro Items" and I need to pay extra to access the Save Form Details and the other features you just described? Thanks to an odd quirk with iOS it is really difficult for me to view the non-pro side so thank you for that, it helped raise my awareness. I'm a little surprised, I wouldn't have thought web form details would be considered a Pro feature so I'll have to enquire. Again, this one will be unfortunately very tricky for me to test (iOS quirk) but it might be all my talk about custom fields would be only beneficial if you did have access to the Pro features. I notice in What are the Pro Features and how do I unlock them? that we include creating custom fields which could very well include viewing custom fields added from a Mac. That would mean you would want to use the Note section if you don't have the Pro features enabled. After getting more used to 1Password I will definitely check out the Pro Features.